LWP helped Environment Canterbury run a collaborative community process to set limits for both water quantity and quality in the South Canterbury Coastal Streams chapter of the Land and Water Regional Plan. LWP staff provided biophysical and economic advice, and performed the overall Technical Lead role within the ECan team. Technical lead involves managing, integrating, translating and communicating the outputs from a multi-disciplinary team of biophysical, economic, social science and cultural consultants and regional council staff. The project involved working with the locally appointed Zone Committee and numerous local and national stakeholders. As part of this we developed numerous innovative approaches to managing and communicating complex technical input to stakeholders. The three-year process ultimately developed a preferred package of solutions for the Zone including regional plan objectives, policies and limits, and numerous on the ground mitigation projects, education, advocacy and community initiatives. 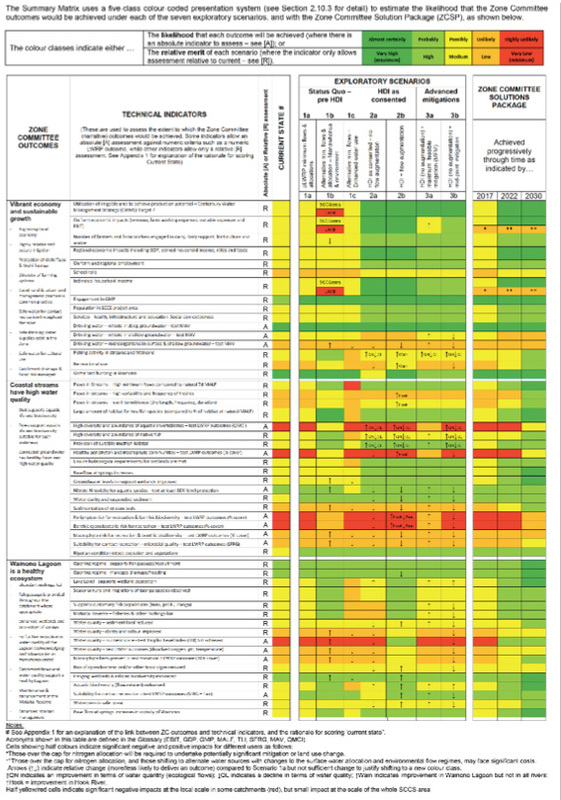 Summary Matrix depicting the relative merits of seven exploratory scenarios and the ultimate package of land and water management solutions developed with the Zone Committee.